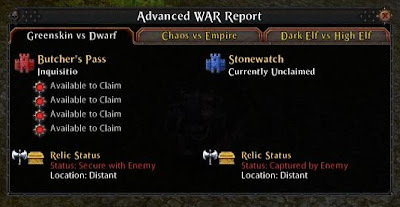 As mentioned yesterday, the Advanced War Report is a new UI element included with Warhammer Online's 1.4.5 patch. This nice window tells you about the status of all the relics and fortresses. Now it is very easy to know who has what, and if it is claimed. Let's take a look at 1.4.5a! See the new medal icon above the WAR report? Click that to bring up the Advanced WAR Report. Here we have the new Fortress and Relic tracker. As you can see, Destruction currently controls both pieces of the relic. Their Fortress is claimed, but no one has taken over the sub-areas yet. Check out the snazzy looking barriers at the top of the Fortress. These will drop when the Relic Guardian is killed, allowing access to the relic. There is also a Choppa corpse here, guess he was testing it out. 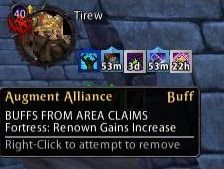 The Augment Alliance icon will show any buffs you are receiving from the Fortress being claimed. 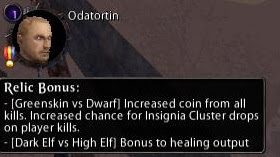 In this example, we just have claimed the Fortress itself, giving us a Renown buff. If subareas were claimed, it would list more. 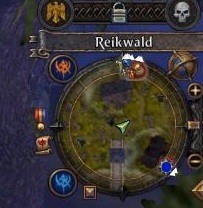 If your realm is currently receiving a relic bonus, a medal will appear next to your portrait. As you can see, Destruction currently has two relics and is reaping some benefits, including the sweet new Insignia bonus loot. 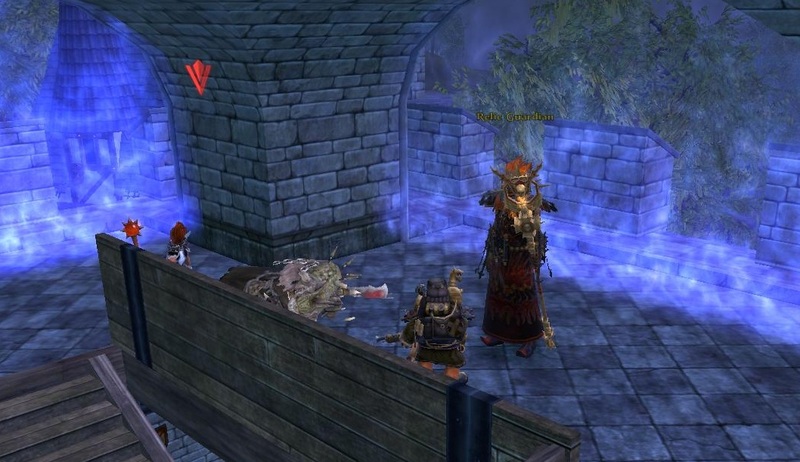 One thing I was not able to get a picture of was the fact that Hybrid (Blue) seeds now drop from the Relic Guardian!